The first time I read this, I was so confused. “The LORD is my shepherd, I shall not want.” Why would I not want The LORD to be my shepherd? It wasn’t until many years later that I ran across a better translation, “The LORD is my shepherd, I shall not be in want.” That makes sense. When I let the One who created me provide for me, I am not left in a state of want. He knows my needs better then I. But, today I can’t see that so clearly. I feel overwhelmed by the rising wall of tasks ahead. I keep hearing myself say, “I need more hours in the day.” How ridiculous is that? Who do I think I am? LORD, you are my shepherd. Not I. The Great I Am is my shepherd, not i. The conflict within me demands, “Who is your shepherd?” A boss, a mentor? Someone with more experience and authority over you? We like these shepherds because we can see them, hear them, receive specific instructions from them and receive the instant gratification of pleasing them. For a moment in time, we feel affirmed, confident and our expectations for the future are bigger and brighter than what we can see at the moment. We like this because we are always available to listen to ourselves and we typically like our own ideas – sometimes we are quite impressed with ourselves. When we always get it right, we avoid the shame of disappointing others and being labeled, Failure. His domain stretches far beyond this earth, which is why sometimes He guides us to do things that don’t make sense in this time and space. When we do them, we face judgement from earthly authorities, the shepherds we are taught to please. But, with the LORD as my Shepherd, I don’t have to worry about it, because He is sovereign over them too. Any labels they place on me are whited out by His glorious light, any labels I have “earned” or placed on myself are consumed by His holy fire. 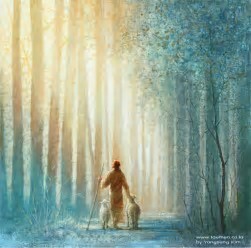 Who am i to tell my Shepherd what i am doing today? Who am i to dispute His direction? Who am i to overlook His guidance? Do i know where the serpent hides? Do i know how to avert his snare as i boldly traverse my path that makes most sense according to my plans? LORD, “make me lie down in green pastures. Lead me beside the still waters. Restore my soul. Guide me in paths of righteousness for your name’s sake” – especially for those who follow me, until they follow You. What were my plans for today? Are you willing to resolve the conflict and let Him guide you today?